Until a year ago, it was just another 160-acre tract of farmland, much like the other hundreds of thousands of acres of similar lands in southern Minnesota. Well, not exactly the same, for this land near Waseca had never been drained by field tile. And the dairyman-owner had used alternative farming practices for many years. One could drive by the farm without even noticing it. But all that changed in the summer of 1999. Now its no longer just another dairyfarm. Instead, it has a new, up-to-date, fancy sounding name and its mission has changed completely. It is now the Agro-Ecological Research Farm (AERF), operated by the University of Minnesota Southern Research and Outreach Center located at Waseca. Its being devoted to research to find answers to a number of lingering drainage and water management questions. The Center, one of 6 located around Minnesota to carry on site-specific research, represents one-sixth of the states area, but that produces one-third of the states cash farm sales. The University purchased the farm in 1991. We recognized that here was a rare and unique opportunity to look for answers to some of our continuing drainage questions, says Dr. Gary Sands. He is Assistant Professor and Extension Engineer-Water Resources, Biosystems & Agricultural Engineering Department, U of MN - St. Paul Campus. The farm was indeed different from its neighbors. Foremost, it had never been tile-drained and its scattered wetlands had been preserved. Its soil structure was less dense and there was less compaction caused by farm equipment. In addition to the new research aimed at improving water quality and increasing crop responses, there are studies on the performance of alternative surface drainage inlets and on controlling the levels of drainage to possibly increase crop yields. The challenge of designing a system to accomplish the stated goals on the farm rested with Dr. Sands and Dr. Lowell Busman, Extension Educator-Water Management, U of MN. They eventually came up with a plan that includes nine separate zones, varying from 2 to 6 acres in size and drained by perforated tubing (formerly known as tile). Two of these zones outlet directly into a non-perforated main that carries water off the farm. The other 7 zones empty into non-perforated mains that drain into existing wetlands on the farm. Three grass waterways carry surface water on the farm into the wetlands. Excess water from the largest wetland is released into one of the tile mains and leaves the farm. 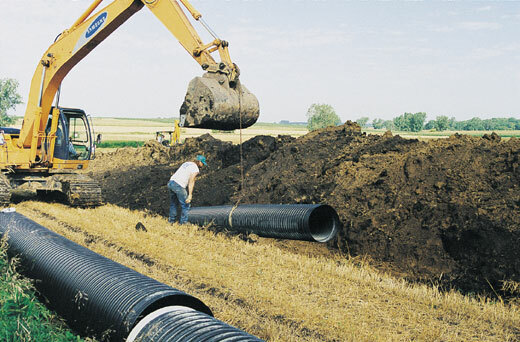 The 4 diameter perforated polyethylene tubing in the drainage zones is placed at varying depths and spacings. Tubing in two of the zones is at a 4 depth, with an 80 spacing. There is concrete tile in another zone at the 4 depth and at the 80 spacing. Two other zones have tubing at the 4 depth, but with lines at only a 40 spacing. Four other zones have tubing at a 3 depth, two with a 60 spacing and two with a 30 spacing. The quantity of underground flow from each zone is measured by tippling buckets. The water will be tested to determine the amount of nitrogen being removed. Large manholes at the outlet ends of each zone provide access for researchers to the buckets and recording devices. One of the zones (4 depth and 40 spacing) is a controlled plot. 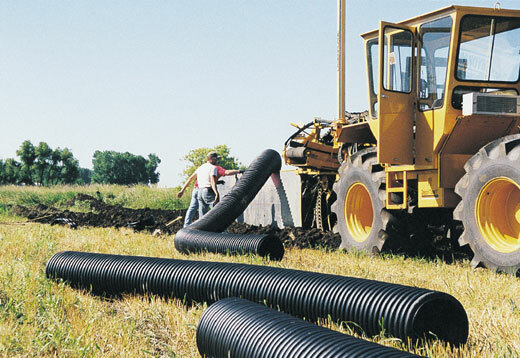 Movable baffles can be added or removed to achieve different depths of drainage. This feature makes it possible to determine effects on crop yields and amounts of nitrogen loss at different levels. Researchers are anxious to find out about the economic feasibilty of controlling drainage on farms in the upper Midwest, similar to the systems already in use in the Carolinas. Using these variations in depth and spacings, and by controlling drainage depths, we hope to get a much more complete picture of hydrology and water management, explains Dr. Sands. Once the elaborate plans were complete, it was time for the next step in the MN Drainage Research and Outreach Project. The three-day 1999 Agricultural and Drainage Workshop and Field Day was held August 10-12 in the 4-Seasons Arena at Owatonna, MN and on the AERF near Waseca. Sponsors included: the U of MN Southern Research Center, Waseca; Iowa State University, Ames; MN Land Improvement Contractors (LICA); and IA LICA. A wide range of attendees came from throughout the Midwest, from Ontario and as far away as Australia and New Zealand. They heard leading researchers, scientists, business and government representatives discuss such comprehensive subjects as Drainage System Design, Drainage and Wetlands, Drainage and Watershed Management, Future Challenges and Opportunities Facing the Drainage Industry and International Drainage Issues. Attendees then viewed the various research and demonstration projects on the AERF itself. LICA members (all but one from Minnesota) who brought equipment and worked at the field day included: Barnett Bros., Kilkenny; Don Loken Excavating, Owatonna; Drainage Design and Survey, Claremont; Eds Backhoe Service, Owatonna; Ellingson Drainage Inc., West Concord; Estrem Excavating, Dennison; Gregor Tiling, Minnesota Lake; Hector Tile Co., Hector; Hodgman Drainage Co., Claremont; Krengel Bros., Mapleton; J.R. Bruender Construction, Inc, Eagle Lake; L & E Farm Drainage, Inc, West Concord; MN LICA, Owatonna; Schumacher Construction, Zumbrota; Stu Frazeur Tiling, Canby; and Iowa LICA, Independence, IA. 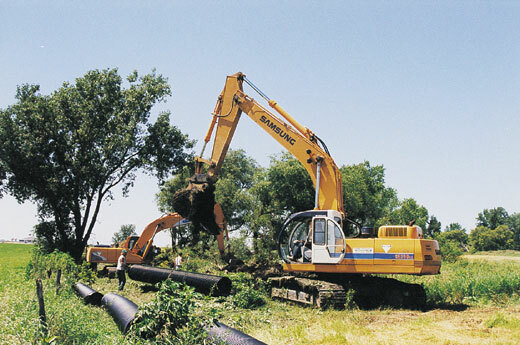 Matejceks Implement, Faribault, MN, moved dirt to help build one of two water retention basins during the field days. They used a IH MX200 to pull a Reynolds scraper. Matejceks had added a buddy seat in the cab of the tractor to allow contractors to ride along and observe the equipment in operation. This could perform the same function as riparian strips next to watercourses that cut down losses of soil and nitrogen. No longer will folks whiz past the little 160-acre farm without giving it a second look as they have in the past. Instead, in the months and years to come, this will likely be the most looked at, studied and statistically-prized piece of farmland in southern Minnesota. For this, the Agro-Ecological Research Farm near Waseca will likely uncover and answer many heretofore hidden secrets about hydrology and water management that may ultimately change long used and widely accepted drainage practices. Like its neighbors, its acres are now, for the first time ever, underlain by drain tubing. Corn and soybeans will be the main crops and there will be minimum tillage. But, unlike its neighbors, its lines of tubing are buried at varying depths and spacings. And the level of drainage is being controlled in one part of the field to keep more water closer to growing plant roots and to encourage more nitrogen uptake by the plants. All the varied systems, the blind inlet studies and the wetland management are aimed at improving the quality of drainage water, while economically increasing crop yields. For more information, contact Dr. Gary R. Sands, 209 Biosystems & Agricultural Engineering Bldg., 1390 Eckles Ave., St.Paul, MN 55108, (612)625-4756, fax (612)624-3005, grsands@umn.edu; or Dr. John Nieber, Dept of Biosystems and Engineering & Agricultural Engineering, U of MN, St. Paul, MN 55108, (612)625-6724, fax (612)624-3005, nieber@gaia.bae.umn.edu; or Leonard Binstock, Exec Dir., MN LICA, 1816 Hemlock Ave., Owatonna, MN 55060, (507)455-9179, fax (507)444-0465, MNLICA@LL.net.